Happy Monday! to start your week out i thought it'd be nice if i loaded you up on some color! i'm currently in the process of picking the quilt pattern for two quilts for Big A's room (he has bunk beds) and the pictures of quilts i'm considering are nice and vibrant. i originally was going to just do straight strips across the whole quilt, since its so simple and wouldn't be too time consuming. but after seeing all these beautiful patterns i'm rethinking that plan. maybe you can help me work it out? 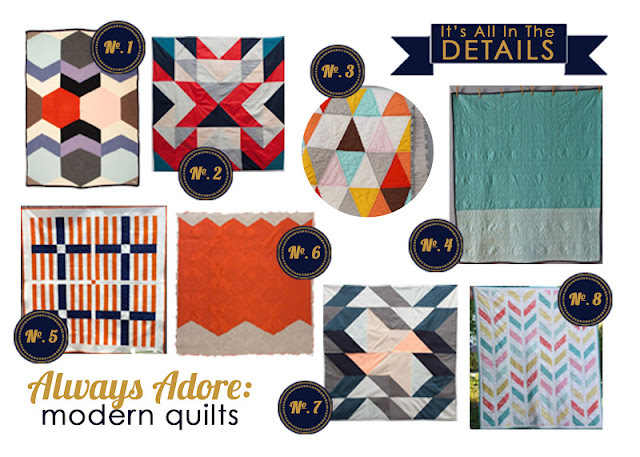 i'm not an expert quilter, so i'm looking for something that will not be labor intensive. i will be machine quilting the entire thing (it would take me YEARS to hand stitch a whole quilt, i just know it), and i am using one solid color of aqua for the top, one solid color of brown for the bottom and a white border all the way around. No.1} i love the large scale pattern of this one, i think being so large would keep it at a pretty beginner level? No.2} oh man. this is a beauty. No.3} i think this triangle pattern is my favorite. but i think it actually might be the colors that are drawing me in and not the pattern? i can't tell. No.4} i like this one because even though it's solid, the stitching has interesting detail. No.5} straight strips in a visually appealing layout. this one is easy but different. No.6} i'm looking at this one more for the way the fabric is cut, the stitching is WAY too detailed for me. it's beautiful though! No. 7} this one has another fun but easy arrangement. No. 8} this one is more labor intensive, but i think i could do it. so what do you think? which one is your favorite? can you visualize any of these patterns just solid aqua? Great idea! i just asked him and he said he likes No.2. i asked him why and he said, "because it's awesome!". haha! wish you were here to help me figure it all out! Then I would go with No.2...He's getting older and he's not goin to want something "uncool" on his bed if he has a friend over, so I would definitely get his approval. That would matter the most to me if it was Ethan and I was making him a quilt. :) I wish I was there too! Oh, how I long to be near you...and making a quilt with you for Big A would be so fun!... like old times. the funny thing is, after taking a closer look i discovered that it's a triangle pattern. it just has multiple colors.